For over 35 years, Cause Effective has helped more than 6,000 nonprofits – large and small – create a better New York for all. Cause Effective strengthens this vital sector by helping organizations build engaged communities of supporters. 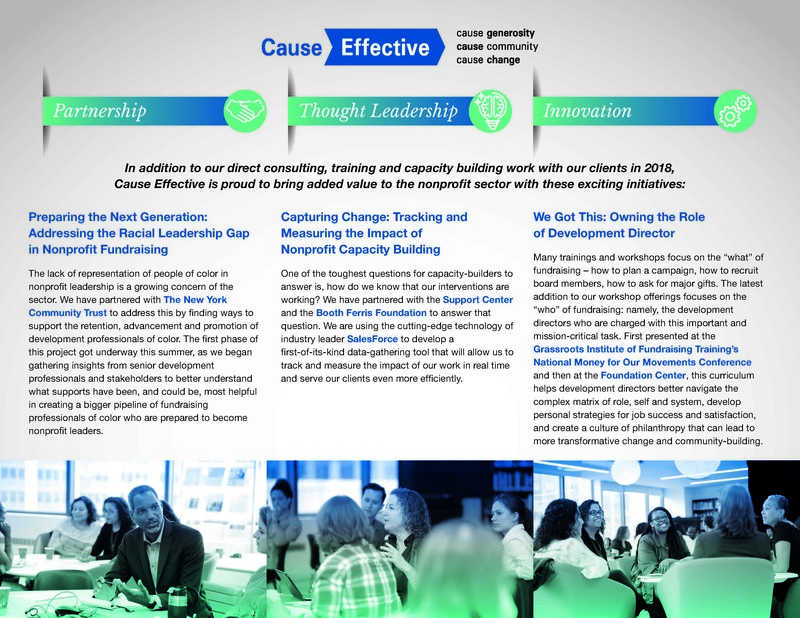 We transform people, culture and systems by coaching nonprofits to learn, carry out and sustain new approaches to fundraising and board leadership. Your charitable gift this year will help Cause Effective reach hundreds of organizations, across the five boroughs and beyond, to diversify funding, activate their boards of directors and leverage the value of special events and anniversaries – all in service to their missions. Thank you for your tax-deductible donation to Cause Effective. Your gift is an investment in a more equitable and vibrant New York! TakeTwo is honored to be a Cause Effective partner. We love that, together, we meet nonprofit needs. Cause Effective has always been there when I need support, training, or advice. They're such an incredible resource in this city. Heard about all the great work cause effective is doing from my dad! Because the help you give non-profit organizations is amazing. Thank you Gregg Cohen for your service to a wonderful organization. Greg Cohen has been the most informative, patient and fair-minded consultant I have ever had the pleasure of working with.